Democratic and Republican members of Florida's Congressional delegation quickly responded to Donald Trump's first Oval Office address. Here's what they said. In his first prime time address to the country, President Donald Trump on Tuesday reiterated calls for a "barrier" along the southern border and explained why he wouldn't reopen the government until he gets $5.6 billion for border security. 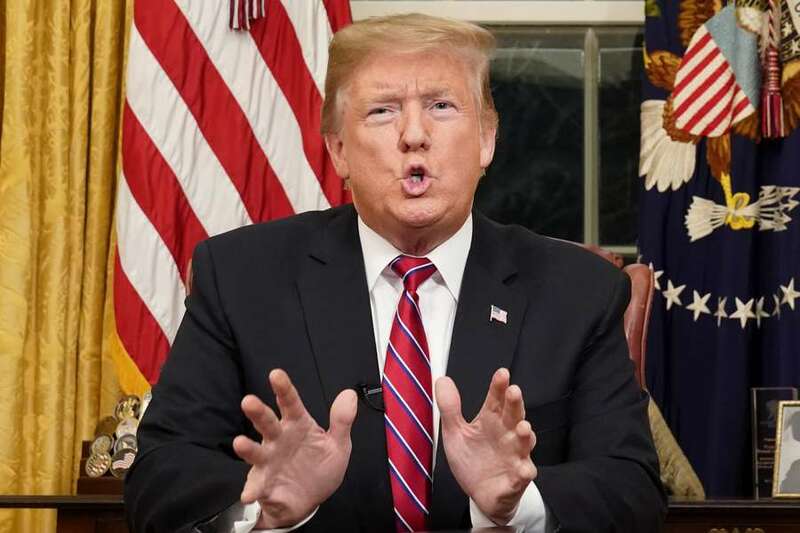 Speaking from the Oval Office, Trump told graphic anecdotes of violent crimes committed by undocumented immigrants and he blamed migrants and the existing immigration system for the country's drug problems and lower employment for black and Hispanic Americans. The speech immediately drew condemnation from Democrats, who responded in their own televised address, and from fact-checkers, who roundly criticized many of Trump's talking points as false or misleading. Others, like Sen. Marco Rubio, appeared to agree with the underlying ideas behind Trump's rhetoric. "We simply cannot allow people to pour into the U.S. undetected, undocumented and unchecked," Rubio tweeted. Some of Florida's Congressional delegation, mostly Democrats, immediately responded to Trump's speech on Twitter and in press releases. Others have yet to react, including Sen. Rick Scott, who was attending a fundraiser Tuesday night hours after he was sworn in. We simply cannot allow people to pour into the U.S. undetected, undocumented and unchecked. Which is why I voted numerous times to spend money to build a barrier to try to prevent illegal immigrants from coming in. You have to control your borders. Trump wants to frame the shutdown as Democrats obstructing his wall, but that’s not the case. Trump is failing to look out for Americans, favoring his own political needs over the needs of the people. Don’t be confused, this is a #TrumpShutdown. "The United States has the responsibility to determine who and what goes through its borders. There are numerous issues that are problematic and remain unsolved. We must modernize our visa system so that American business owners have the power to lawfully hire employees for job vacancies that are hard to fill. Modernizing our visa system also allows us to better track who is traveling through our borders. We must find a solution to the more than 11 million undocumented individuals who are living in the shadows, and that solution must be reasonable and humane. Lastly, a bipartisan solution to immigration reform must bolster the economy and respect the rule of law of this great nation. "Just tonight, I presented four amendments that would address the legal status of DREAMers and TPS beneficiaries, yet Speaker Pelosi was not willing to consider even one of them. I reiterate my commitment to working with any Member of Congress, Republican or Democrat, Representative or Senator, who wants to resolve this issue once and for all." "While the government remains shut down and hundreds of thousands of American families worry about making ends meet without a paycheck, President Trump tonight offered nothing new, only more fear-mongering and the continuation of a self-inflicted crisis. "The only crisis on the border is the one that President Trump has created by falsifying reports to instill fear, imprisoning children and separating families, and failing to hire enough officers to staff ports of entry. "The President couldn't get Mexico to pay for his wall. He couldn't get Congress to pick the pockets of the American people. The GOP, which could have passed wall funding at any time over the past two years, knew it was an unreasonable idea." "Eighteen days into the government shutdown, the President continues to play games with American security. The President can reopen the government tonight by supporting bipartisan funding bills that have passed the House and received overwhelming support in the Republican Senate. Instead, he continues to fabricate absurd claims that thousands of terrorists are crossing the border from Mexico, while leaving nearly one million federal workers in limbo. This isn't leadership; it's a ransom demand."